This Quick Start automatically deploys Micro Focus Enterprise Server into a new or existing virtual private cloud (VPC) on the Amazon Web Services (AWS) Cloud in about 1 hour and 15 minutes. The Quick Start includes AWS CloudFormation templates and a deployment guide with step-by-step instructions. It also includes an optional BankDemo demonstration application for testing the deployment. Micro Focus Enterprise Server is an application deployment environment for IBM mainframe applications that have been running on the IBM z/OS operating system. Enterprise Server enables you to modernize and integrate your mainframe applications with technologies such as .NET and Java. It also provides flexible application deployment—across Linux and Microsoft Windows—on AWS. System integrators and Micro Focus customers who have deployed an IBM mainframe workload to Enterprise Server on premises, and want to migrate these rehosted applications to AWS. Those who want to explore moving an IBM mainframe workload to AWS, and need a fully functioning production server for running mainframe applications that they can deploy quickly. When you deploy the optional BankDemo demonstration application, TN3270 communications from the internet also flow through the internet gateway. Optional Remote Desktop Gateway (RD Gateway) instances in the public subnets for administrative access. In the private subnets, Enterprise Server instances that can be accessed via a TN3270 terminal emulator or HTTP. A Network Load Balancer to automatically distribute requests for the BankDemo demonstration application to the deployed Enterprise Server instances. An optional Fileshare instance that is preconfigured to be accessible from the Enterprise Server instances (via Fileshare) and accessible directly via the Common Internet File System (CIFS) protocol share for batch processing. 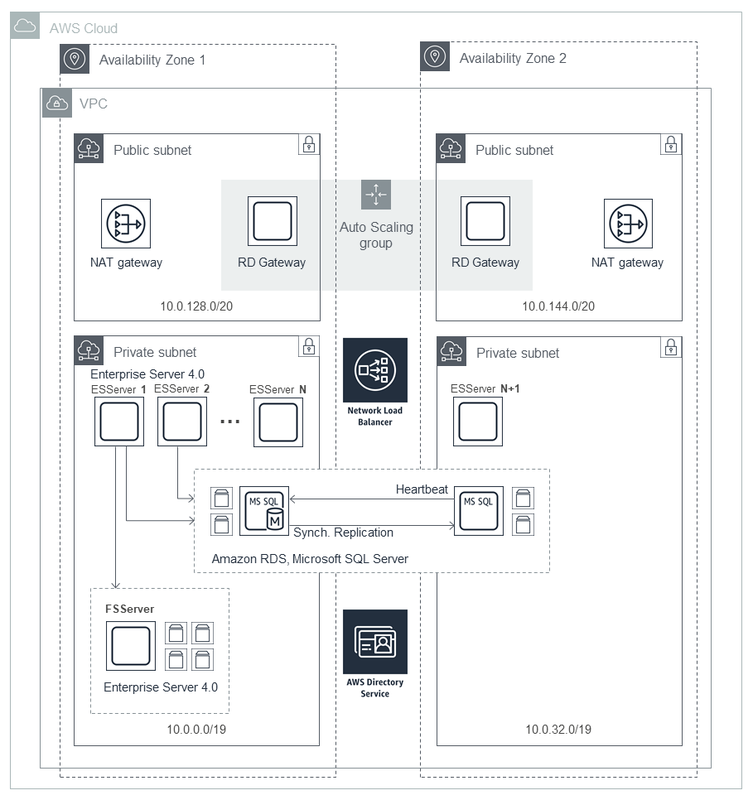 Optional Microsoft SQL Server database connectivity using Amazon Relational Database Service (Amazon RDS) for SQL Server with support for failover and automated backups. AWS Directory Service for Microsoft Active Directory (also known as AWS Managed Microsoft AD). Review the terms of the Micro Focus End User License Agreement. Test the deployment by running an optional demonstration application called BankDemo. If you're an existing user of Enterprise Server, you can use one of your existing licenses. If you're not an existing user of Enterprise Server, you can request a trial license from Micro Focus. This trial license for Enterprise Server on AWS is only intended to be used for a maximum of 90 days, and isn't intended for production use. After the trial period, you're responsible for acquiring the necessary licenses directly from Micro Focus to continue using Enterprise Server on AWS.